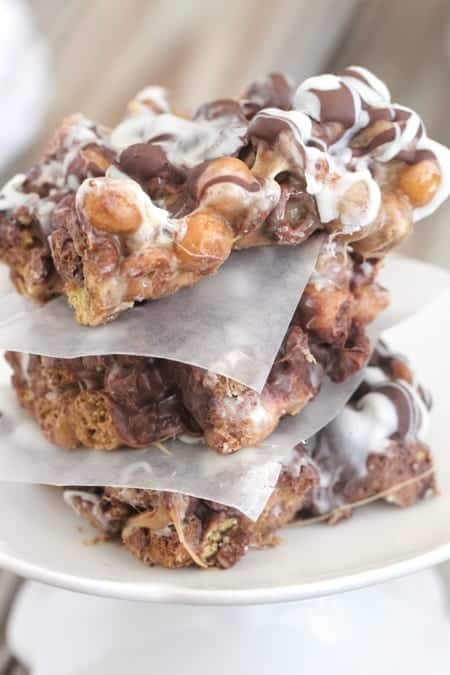 These Gooey Chocolate Peanut Butter Crunch Bars could not be more delicious and perfect for a back to school weekend dessert! 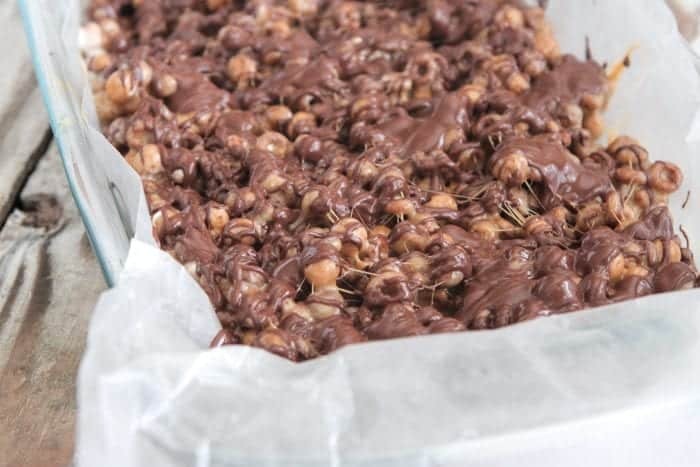 You are in for such a treat with my Gooey Chocolate Peanut Butter Crunch Bars! 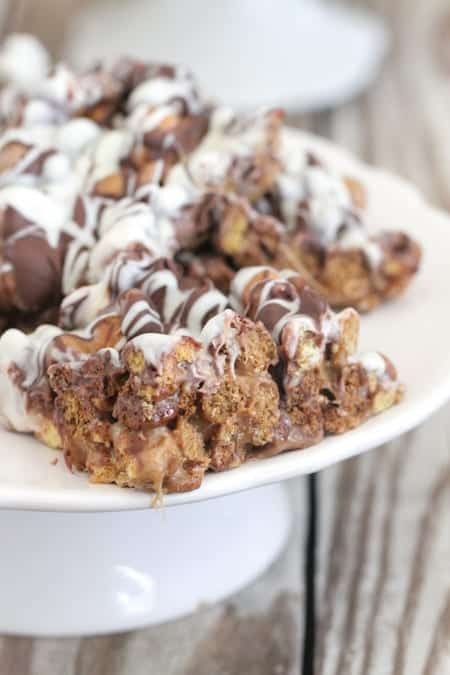 Bringing you a fun Back To School Weekend Dessert! This time of year is so exciting as our kids start a new school year. With so much going on, getting used to new schedules, things can get hectic too. We want to help put you and your family first during this exciting but hectic time of year. One of the biggest things that has helped me for back to school season is organizing and preparing the kids school lunch the night before. I’m not saying we are perfect at this every day, but when we get lunches made before hand, our mornings seem to go so much smoother and enjoyable. I also like to make it a team effort. Mom makes the sandwiches and the kids get their snacks and water bottles ready. Team effort is always nice. I love how General Mills Cereals is on a journey to make cereals even better, while removing things you don’t want so you can feel good about choosing cereal as your child’s first meal of the day. 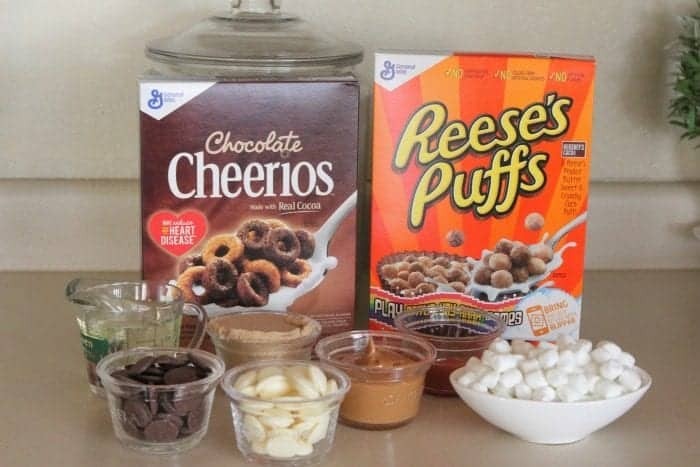 That means removing artificial flavors and colors from artificial sources, and using only real ingredients like honey, cocoa and cinnamon to make your family’s favorite General Mills cereals likes Honey Nut Cheerios, Chex, Cocoa Puffs, Cinnamon Toast Crunch and many more. 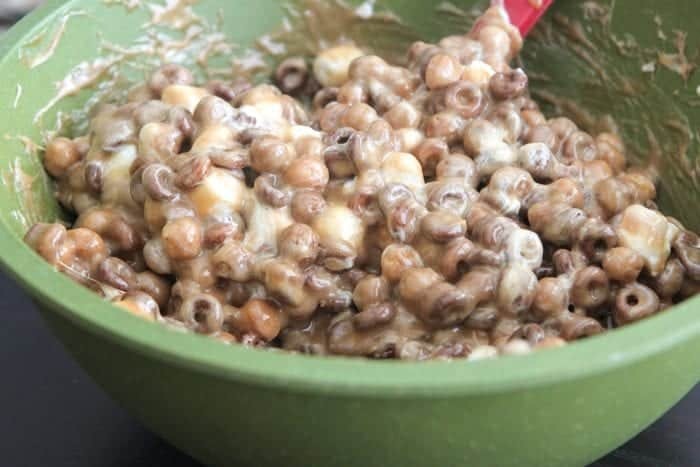 Today, more than 90 percent of General Mills cereal recipes do not have artificial flavors and colors from artificial sources. 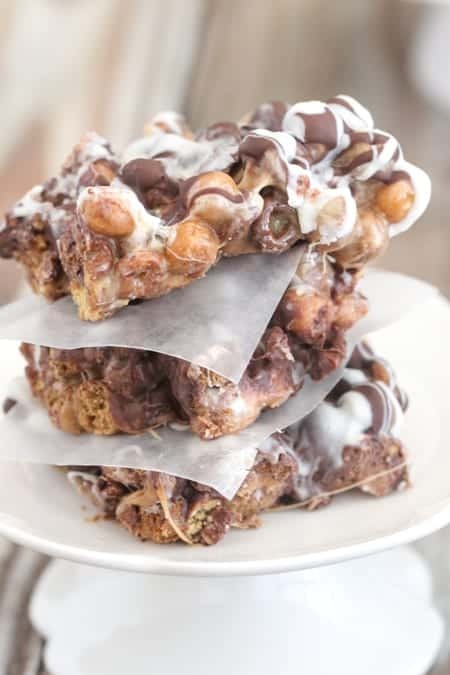 To make these gooey bars, start by adding your cereal and marshmallows into a large mixing bowl. Give a nice stir and prepare your peanut butter sauce. 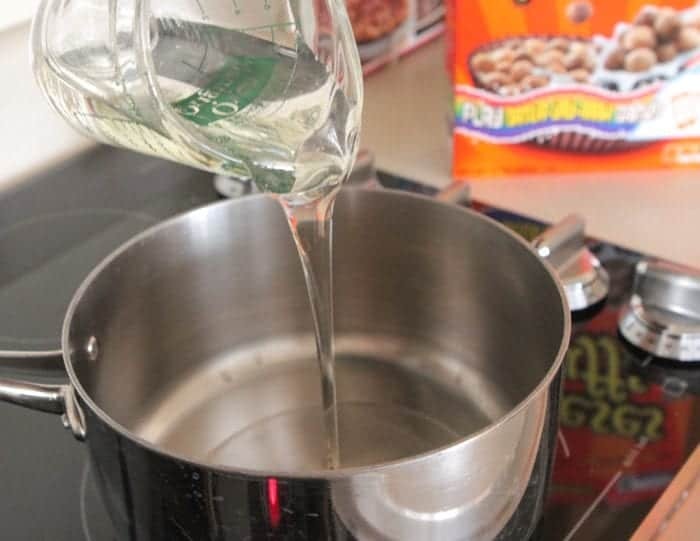 Heat up your corn syrup, brown sugar and peanut butter into a saucepan until it comes to a low boil. You’ll stir in your vanilla and salt too. 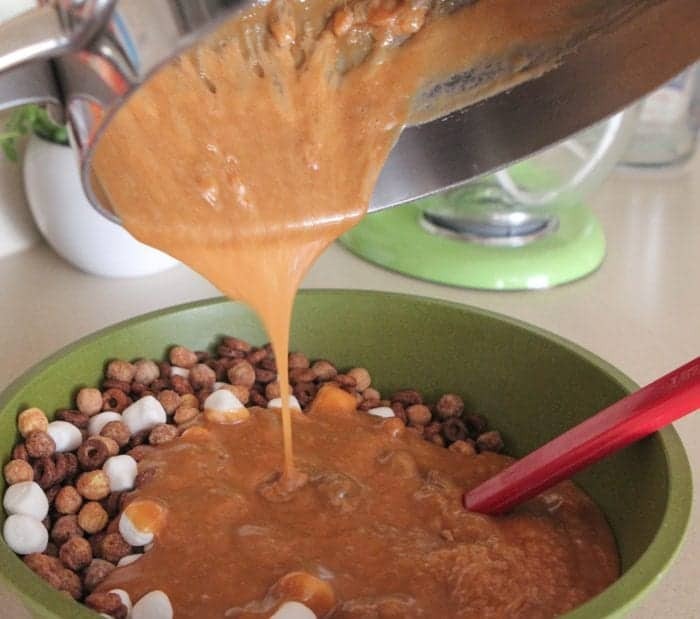 Pour Into Cereal Mixture and Work Quick! 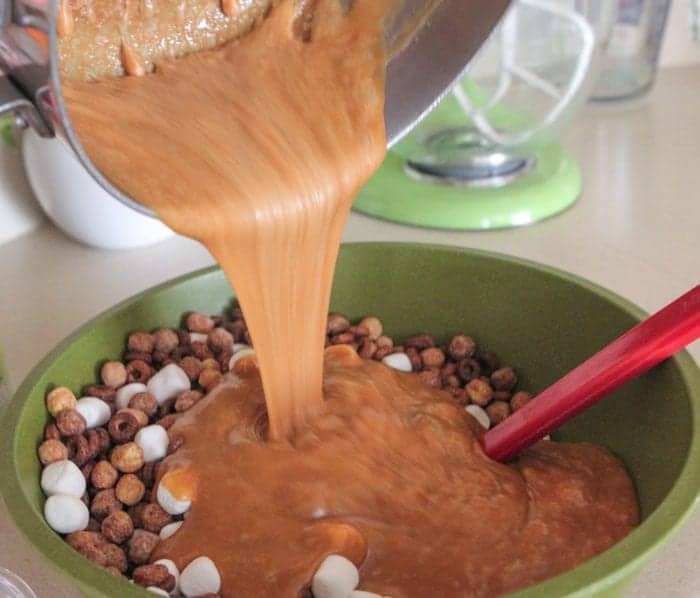 Pour right over your cereal mixture. 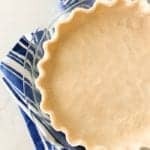 Transfer to your lined baking dish. Note: Spray your parchment with cooking spray, the bars will come out of the pan much easier. Spread your mixture as evenly as possible. A little drizzle of white chocolate too! Let cool and set up for a good hour before cutting into squares. 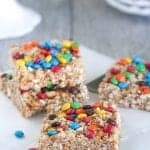 These bars are so great for transporting to parties, the kids and adults love them! 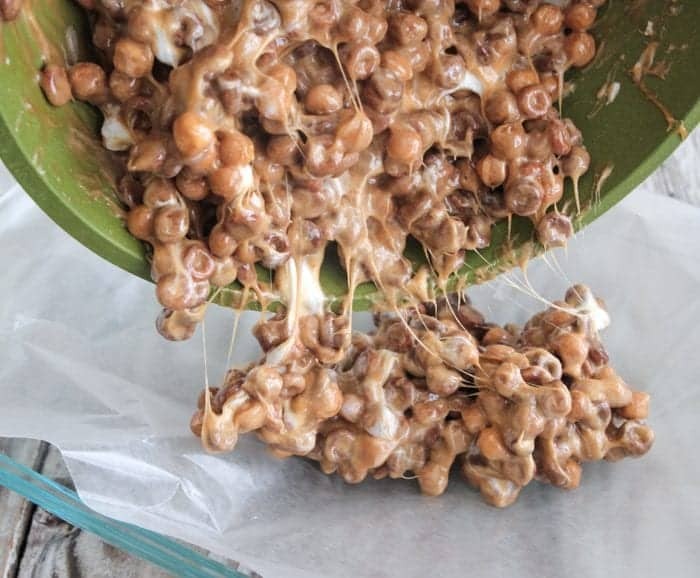 The gooey factor is off the charts. Enjoy! 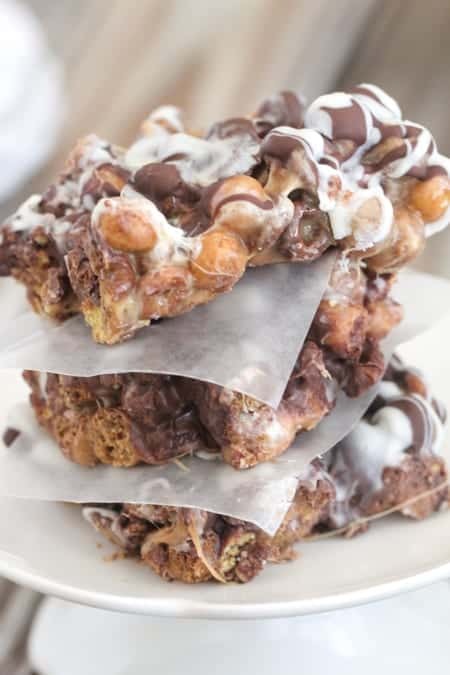 Check out my fun videos on how I make these fun bars! 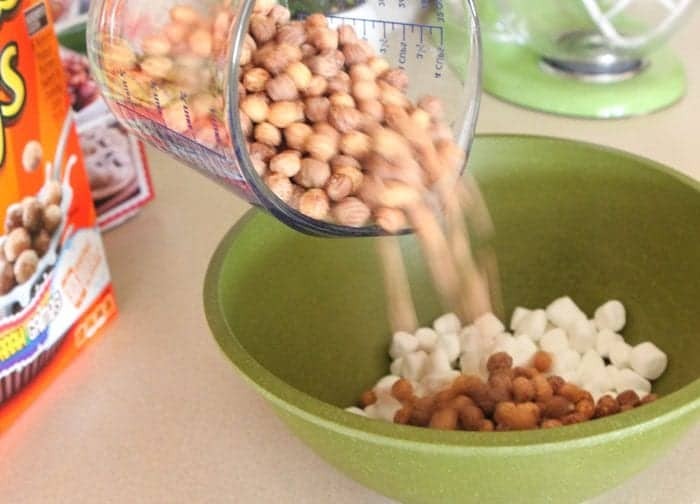 Place cereal and marshmallows into a large mixing bowl. Line a 9x13-inch baking dish with parchment paper and spray generously with cooking spray. Place brown sugar, corn syrup and peanut butter into a small saucepan over medium heat. Stir and let boil for one minute. Remove and stir in vanilla and salt. 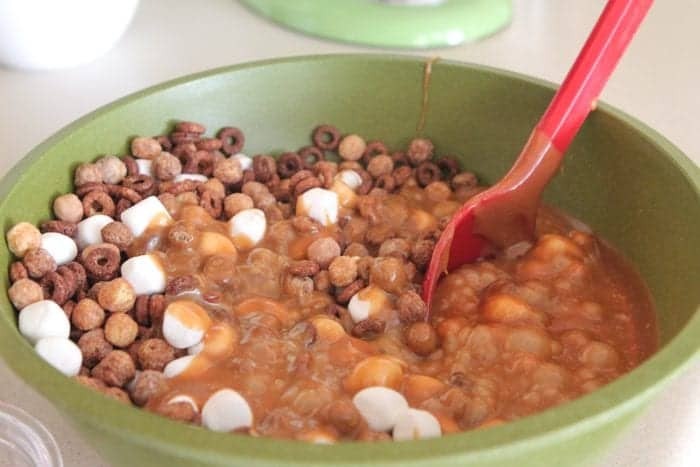 Pour over cereal mixture, stirring until well combined, the marshmallows will melt while stirring. 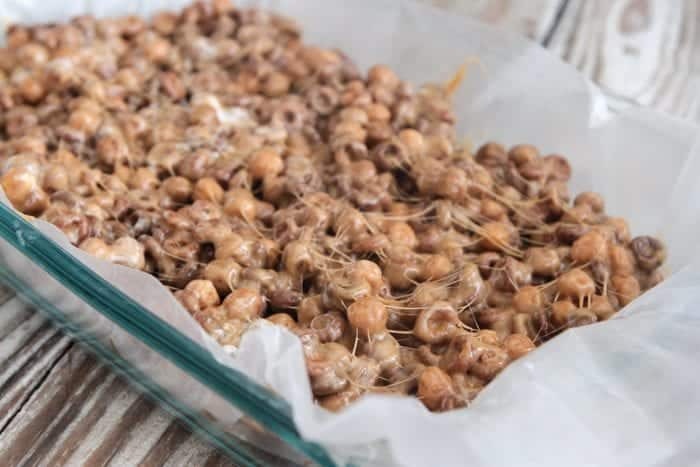 Pour cereal mixture into prepared baking dish spreading and pressing evenly, will be sticky, doesn't have to be perfect. 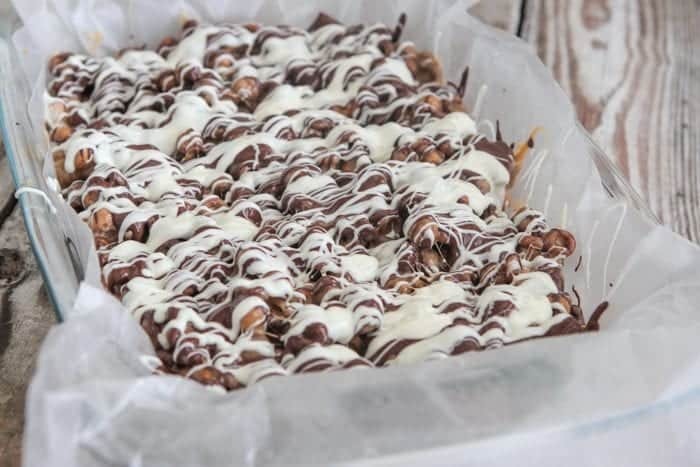 Drizzle top layer with melted white chocolate then with melted chocolate. Let cool completely before cutting into squares. Serve room temperature. Disclaimer: This post is in partnership with General Mills. All thoughts and opinions are 100% my own. Thank you for supporting the brands that make Picky Palate possible. 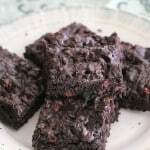 LOVE this fun treat recipe! Loved this crunch bars. My little one will love having it any time of the day as she loves crunchy bars with chocolates. Its a fun treat for me and my kid, will try for sure. 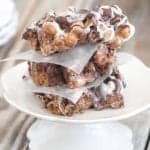 what an easy treat to make! it would be devoured in our house! Forget the kids, I’ll eat this entire pan! How fun are these! Such a fun and tasty back to school treat. My eyes are bugging out of my head- these look AMAZING! I could eat this whole pan of treats all by myself. 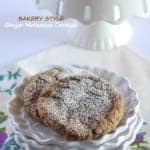 Oh my goodness what ooey gooey delicious treats! 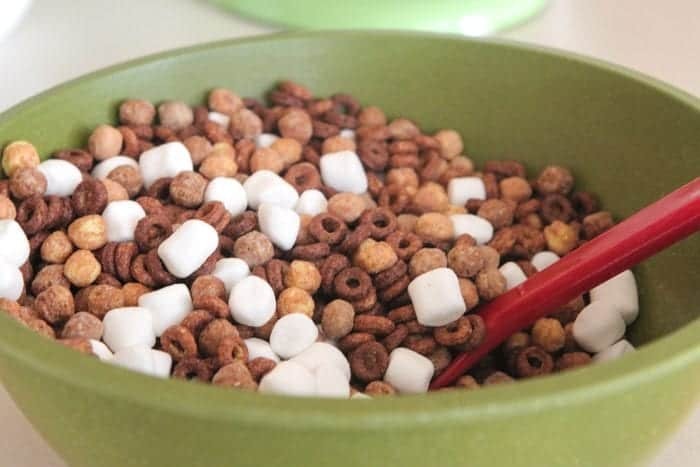 Place cereal and marshmallows into a large mixing bowl. Line a 9×13-inch baking dish with parchment paper and spray generously with cooking spray. say regarding this post, in my view its truly amazing for me.